Gallon/larger pots are too large to ship. Pick them up at the nursery or an offsite event. 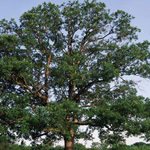 Impressive in size and bark coloration, it is best used along drainages and wooded borders along the edges of yards. Q: How tall is the tree in the gallon tub, when purchased? A: It depends on when you buy them, but they're usually around 2 feet tall in the gallon pots.